"On the Way to Cape May" stop at the Herford Inlet lighthouse in North Wildwood for a photo op before enjoying a delicious lunch at "The Lobster House" in Cape May Point en Route to the Ferry. After lunch take the Ferry to Delaware seeing the "Breakwater Lighthouse" in the Harbor of Refuge on the Delaware River. Passengers arrive and check-in at the Doubletree, Oceanfront resort in Ocean City, Maryland before enjoying a great dinner at one of Ocean City's finest restaurants. At your leisure have breakfast at the Marlin Moon before meeting your guide to visit the OC Lifesaving station Museum for a bit of Ocean City's Past and Present, then take a guided tour of Assateague Island's famous "Home of the Wild Ponies" and Visitors Center, and finish the morning at the Fenwick Island Lighthouse. Enjoy a fabulous lunch overlooking the Marshland at "The Lobster Shanty" before setting off to experience the "DiscoverSea Shipwreck Museum" with an amazing presentation and tour. Afterwards browse through "Seashell City" for a treasure of your own. Passengers then return to the hotel to spruce up for dinner at Harrison's Harborwatch located at the inlet, followed by an upscale magical performance at the charming Dickens Parlour Theater. Enjoy breakfast at your leisure at the Marlin Moon before checking out to depart for Chincoteague, VA. Enroute visit the Assateague Lighthouse for a photo op. Travel through the Chesapeake Bay Bridge Tunnel where you may catch a glimpse of the Cape Charles Lighthouse. Arrive and check into the Surfbreak Oceanfront Hotel and prepare for a delicious dinner at Rockafeller Restaurant overlooking the marina. Enjoy the remainder of the evening on your own. 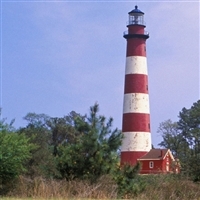 Enjoy breakfast at your leisure at Calypso's at your hotel before visiting the Cape Henry Lighthouse in Fort Story. Return to the hotel for freetime and lunch on your own in Virginia Beach where you may wish to visit the The Atlantic Wildfowl Heritage Museum, a free museum right next door to the hotel. End your stay in Virginia Beach with an "all you care to eat" seafood buffet at the popular Captain George's Restaurant. Enjoy breakfast at your leisure at Calypso's and checkout to depart for an enjoyable afternoon of shopping and lunch on your own in gorgeous St. Michael's Maryland. Four nights accommodations (Two nights in Ocean City, MD & Two nights in Virginia Beach), Four breakfasts, Four Dinners, Lunch at the Lobster House in New Jersey, Entertainment at Dickens Parlour Theater, Escorted tours of Assateague Island, The Discoversea Shipwreck Museum, and the Atlantic Wildfowl Heritage Museum, plus views of seven different lighthouses along the east coast.